The past few years we have planted Italian Romano bush beans in the garden with a very small yield. This year we finally have a good crop. I love these flat green beans because they have a meaty quality to them and they keep well in the refrigerator. For this recipe you will need to make a tomato sauce in advance, then use about 4 cups of the sauce for the beans. Save the remainder for another use. 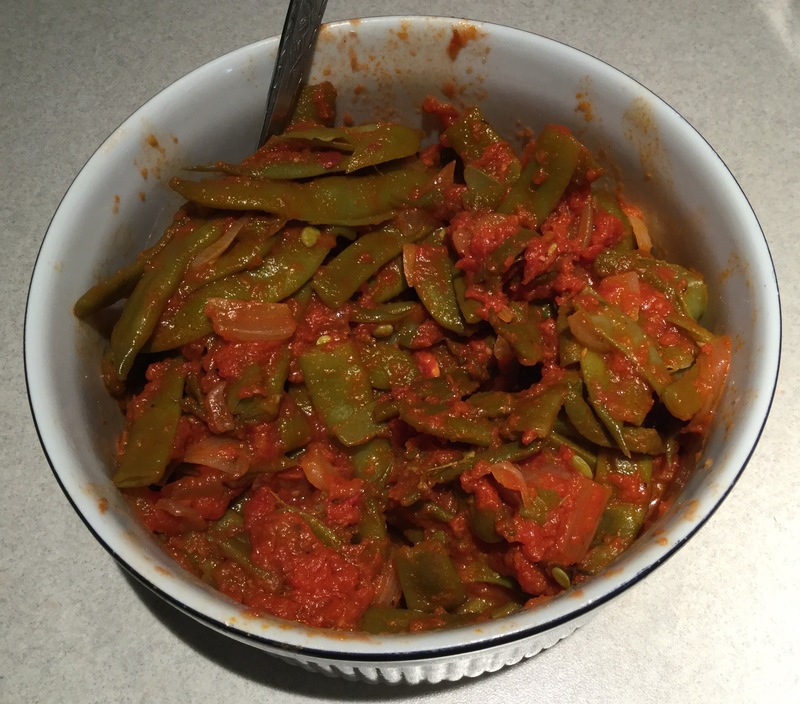 This bean dish is simple but absolutely delicious. In a 5-quart pot heat olive oil on medium heat. Add onions and cook 7-10 minutes until soft. While onions are cooking put tomatoes in a blender to purée. Add garlic to the softened onions and cook 2 minutes. Add puréed tomatoes, water, salt, pepper, sugar and herbs to taste. Cover, turn heat to medium low and cook 30 minutes, stirring occasionally. While sauce is cooking, bring 4-quart pot full of water to the boil. Add 1 tablespoon kosher salt. Add trimmed beans and cook 8-9 minutes until beans are tender. Drain. Place 4 cups of the sauce in a large frying pan. Save the rest of the sauce for another use. Add the cooked beans to the frying pan with sauce. Add 1/2 cup water. Add salt and pepper to taste. Cover and let cook on medium low heat for 45 minutes or longer, until the beans are soft and tender. You may need to add a bit more water to keep the sauce from getting too thick and sticking to the bottom of the pan. Serves 6. This entry was posted in Christmas, Easter, Pasta, Sauces, Thanksgiving, Vegetables, Vegetarian. Bookmark the permalink.